You know her from TV and food writing. But what does Nigella Lawson eat when the cameras are turned off? Join Diana Henry for supper with the Queen of Christmas cooking. "I am not a chef. I am not even a trained or professional cook. My qualification is as an eater." So writes Nigella Lawson in the preface to her first book 'How To Eat', published 20 years ago. 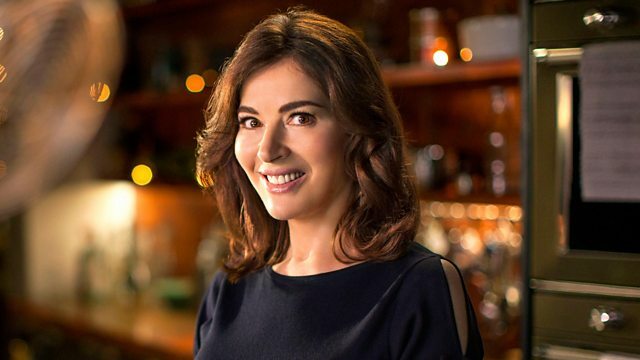 In this programme, Nigella shares the food memories, the dishes and flavours which have shaped her life. Being taught to cook by a mother with eating disorder, balancing a career in journalism with cooking for young children, what food means when you lose those closest to you, and how navigating a rise to food-icon status sometimes feels like joining the circus. When food writer Diana Henry read 'How To Eat' for the first time, it was on a rainy afternoon after the birth of her first child. Nigella's recipes got Diana back into the kitchen and when she said so in a recent article, she realised the electric influence Nigella has had on home cooks all around the world. Now Diana joins Nigella at home in the kitchen to talk life, death, and roast chicken. Marmite sandwiches to 'Steak Mirabeau', grouse to goose fat to Christmas "goddess". This is Nigella in her own words. Talking life, death, and roast chicken.